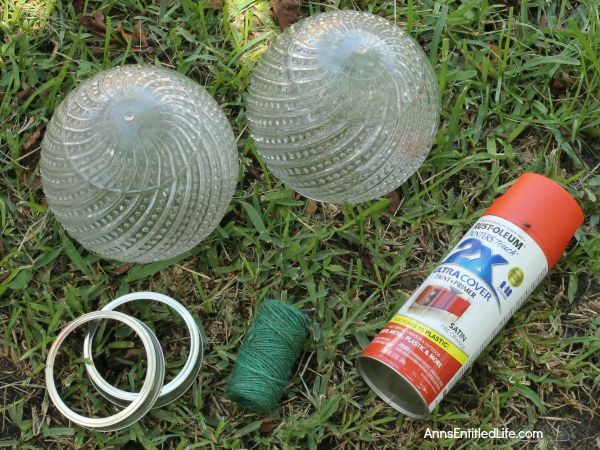 Upcycle your old glass globes inexpensively and easily to create beautiful outdoor table lighting, festive holiday decor, beautiful mantle accents and more. There is no limit to where a can of paint, an old globe light and a battery operated tea light can take you! 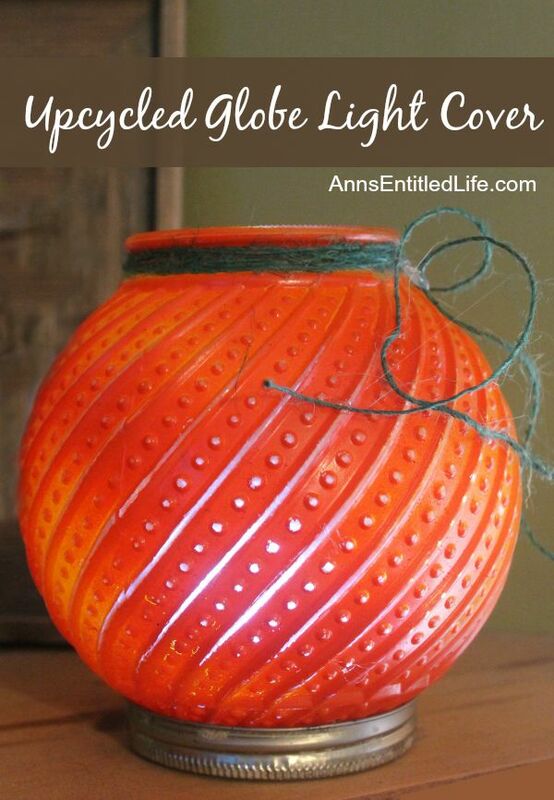 Have an old light globes in the closet from from an update and wondered what to do with it? 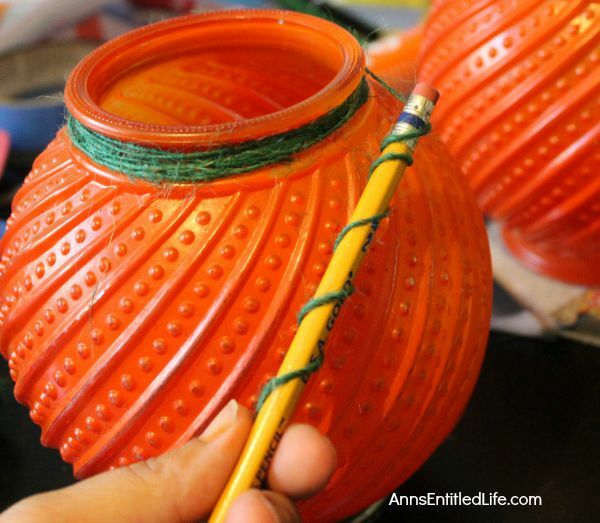 How about making a holiday or seasonal decor that is close to the original purpose? This example is orange “pumpkin” for Halloween. This can be set up as mantle decor in an entire patch if making a few, or used as an accent if making only one or two. How about making a dozen or so and lighting up the porch on Halloween or for Christmas? Or using a lighter color for the backyard table and garden parties? Since these are glass, it is necessary to watch where they are placed. While no live candle should be used, kicking the glass over could result in it being broken. • Glass Globe Light Cover (choose globes that have a texture) If you don’t have them on hand, they are found very reasonably priced at thrift stores or yard sales. The more interesting, the better. The globe needs to have some texture, so in this case interesting is not only good, but necessary! • Wash globes well in hot soapy water, dry completely. Rub down globes with a rag or paper towel soaked in rubbing alcohol – this helps remove any residual oil or fingerprints, and allows for better paint adhesion. 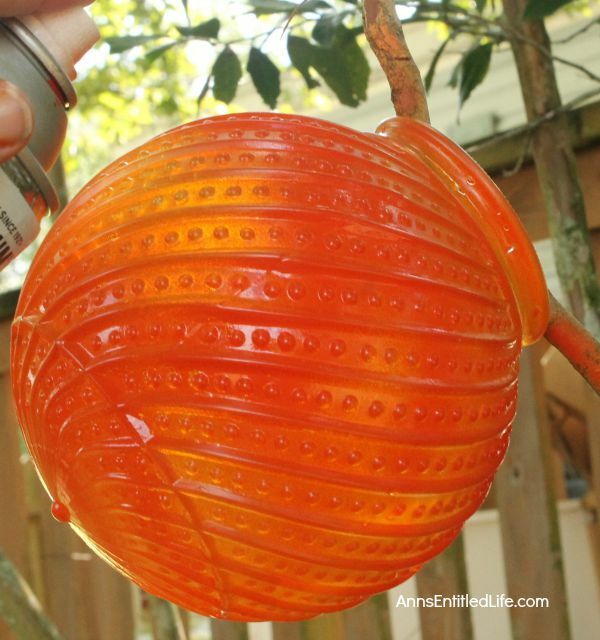 • Once dry, take globe’s outdoors to spray paint. • Hanging your globe from a nearby tree branch is a good way to get complete paint coverage, but watch out for over spray! Hold up a piece of cardboard on the opposite side of where the paint is being sprayed to catch any paint over spray. • Spray the first layer lightly. This creates a tack coat that will allow other coats will stick well too. • Spray another coat or two of paint allowing for dry time in between until desired coverage is reached. • After final coat let dry 2-3 hours. 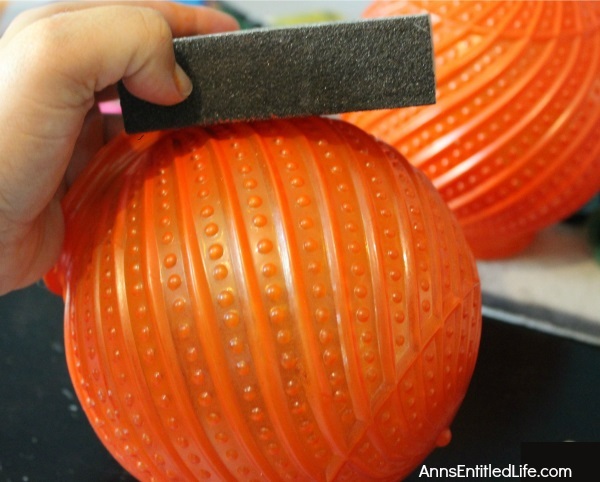 • Since these globes have texture, this gives an gives an easy surface to rub off paint with sandpaper and let light shine through. • Once the paint is completely dry, sandpaper and scrub off paint only on the raised, textured areas. • Wipe away dust with a damp paper towel. 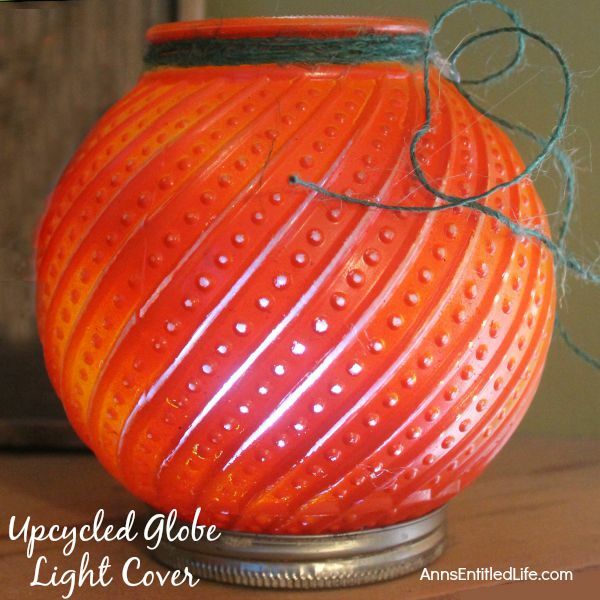 • Apply hot glue to mason jar ring and press into bottom of globe to create a stable base for your globe light. 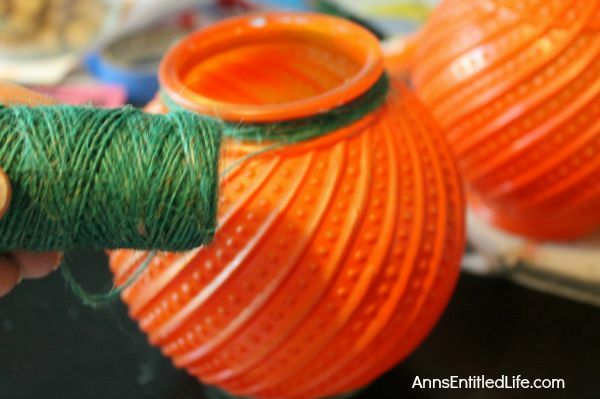 • For decoration, wrap some Twine (or Raffia Ribbon) around the screw in indentation of the light base. Pull tightly to knot. • Drop in a small battery operated tea light. Do not use a flame candle. 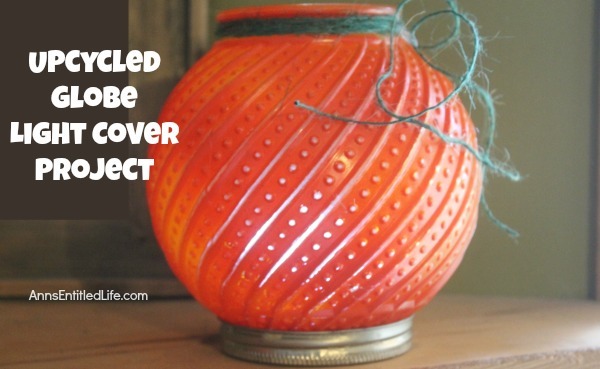 If you are looking for a simple project to upcycle old globe lights, give this easy project a try. You could do green or red for Christmas, orange for Halloween or Thanksgiving, Blue, Yellow or Pink for summer; the ideas for the seasons and the holidays are endless. You have certainly become crafty to say the least!! This is beautiful! !